Discover Victoria Harbour and admire views of Hong Kong Island from the water on a hop-on hop-off tour by boat. 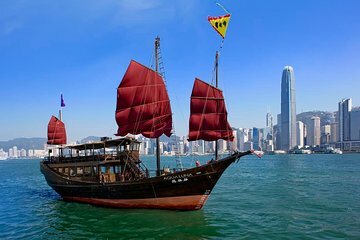 Explore the areas of Tsim Sha Tsui, Central, Wanchai and Hung Hom independently, traveling between them on this Aqua Luna cruise circuit, which runs approximately every hour. An ABSOLUTE thing to do if you're in Hong Kong no doubt! I mean, riding a traditional junk in Victoria Harbour??! Cannot miss this unless you're a frequent traveler to Hong Kong! When I did it, I was the ONLY one aboard, so felt like a VIP..... can't get better than that!! It was outstanding!